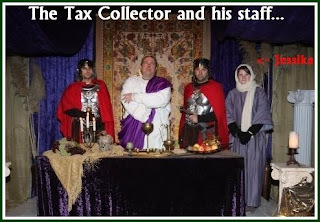 My oldest daughter is a Tax Collector's servant (again). She's been working long, hard hours in Bethlehem for the last two weekends. My middle Sprout? Well, she seems to have developed leprosy. And I'm OK with this as well. Bethlehem" that took place over the last two weekends. Observers (that's us, the general public) got to experience a little bit of authentic "Christmas" as we were guided on a walkingtour through the 'town' of Bethlehem - you get to wander among market stalls; pet live camels, donkeys and lambs; smell fish cooking (yes, real fish!) 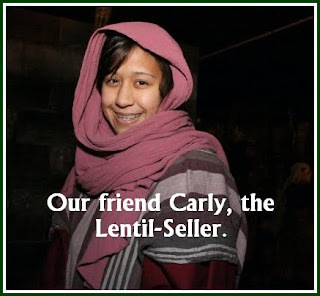 and lentils stewing; watch potters, weavers and bakers, and interact with more than 100 people dressed and acting in character as townsfolk, the Innkeeper, fierce Roman Soldiers, fishermen, shepherds, a tax collector, Rabbis, wisemen, children. At the end of the walk-thru, you come to the stable with Mary, Joseph and the Christ Child - angels sing, and all is right with the world. This spectacular event takes place outdoors, at night, in the cold (how authentic! ), but fortunately everyone's pretty well wrapped up under those robes. Even Baby Jesus had heavy, insulated blankets and tiny mittens. My youngest daughter (and grandparents, friends and neighbors) LOVED the program, and we waited in the long lines and walked thru several times. Little Sprout enjoyed the many friendly animals, and looking for her big sisters in their costumes, and we enjoyed seeing the familiar faces of many friends and my daughter's classmates among the cast. If you live in the Seattle area and didn't make it this year, make a note for next year - it is NOT to be missed. 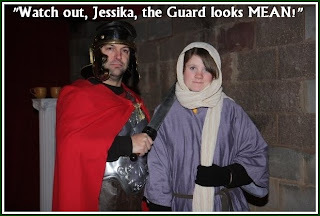 As I may have mentioned, my Jessika is one of the Tax Collector's servant-girls and in her 'role' she fusses around his tent while he collects taxes from those entering Bethlehem. Not a big role, but she's absolutely LOVING it. This is her third year participating in the program. Her sister Olivia joined as a "leper", part of a raggedy group that skulks in the shadows around the walls of the city (unfortunately no pictures of her - leprousy doesn't make a person very photogenic!) . I'm so proud of my girls - and all the participants!! It's not an easy way for anyone, let alone a restless teenager, to spend seven long, icy-cold evenings. 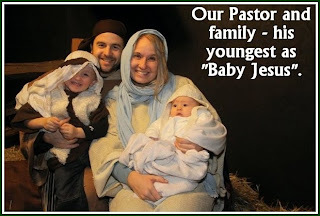 I'm proud of their dedication and passion to share The Christmas Story. 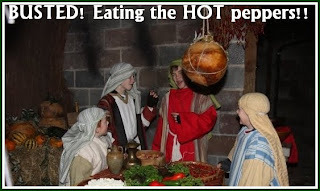 Yes, there were plenty of behind-the-scenes antics - shepherds kept texting for cocoa, guards "arrested" random innocent people, chickens nibbled ears, a couple torches burned too high and curious little boys mistakenly chomped on the VERY hot peppers. Yes, those props are all real! But what a wonderful event to be a part of! The cast and crew are well-cared for, kept warm and fed by a hidden staff of more volunteers who keep soups, coffee, cocoa and cider available for quick snacks behind the scenes. Knowing that there were other vegetarians/vegans in the production besides my daughters, I offered to bring a big pot of vegetarian chili for part of an evenings warm-up chow. 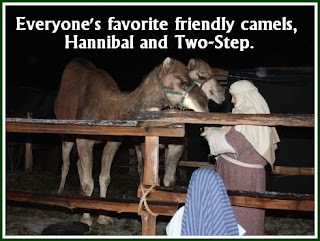 Here's my super-easy chili recipe (one of my daughter's favorites) and some (a lot) of pictures from "Journey to Bethlehem". Enjoy. In a large pot or dutch oven, saute onion and garlic in olive oil over medium heat 3-4 minutes. Add peppers and cook until softened, about 3-5 minutes more. Add burger crumbles and cook 5 min more. Add remaining ingredients. Bring to a boil, then reduce heat. Simmer 20-30 minutes or until flavors combine and chili is thick. That looks like so much fun! What a great way to share the Christmas story with the community. I wish my church had something like that. 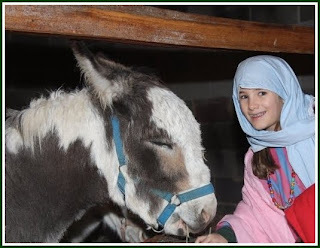 I'm not Christian, but I went through one of those living nativity things a few years back just for the hell of it. And it was pretty darn neat. They even had a real camel, who interestingly belongs to a man in Memphis who keeps the camel as a pet. The chili looks delicious! 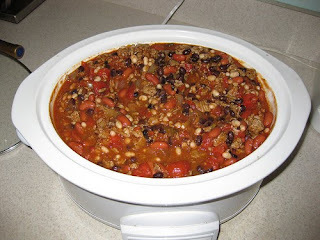 You are so sweet for bringing chili to your daughters and vegetarian/vegans in the cast! I am sure it was a hit!